What others should know: Required to clear the magazine on the Benjaman Maurada. What others should know: These things are supper heavy! I bought the Marauder Pistol and spent lots of time looking for a lite weight scope, I never considered the mounts. They were way too heavy for this gun. I used some from my 22 rifle that weighed much less. These are in my spare parts drawer and I doubt I will ever use them. Things I liked: clamps seem to work just fine. What others should know: I got these free with a 98K with free scope and mounts. The scope was junk these mounts work good so far with another brand of 3X9 scope. Things I liked: purchased these rings with the umarex gauntlet bundle. Also purchased the twenty for $20 option. Rings have been solid and hold the Mantis scope firmly. Things I liked: The quality and finish of the rings is fine. What others should know: I bought theses rings as part of the bundle of products that Pyramid Air offers with the Umarex Gauntlet PCP. The bundle also included a 4x16 scope, which came with a very nice lens cap set. The problem is that the medium height rings do not provide enough clearance between the top of the barrel and the front lens cap. The cap has to be jammed into place and in the process places pressure on the barrel, which I am sure affects accuracy. If you plan to order rings for the Umarex Gauntlet, order HIGH rings, not MEDIUM rings. You will be glad you did. Things I liked: Perfect match for Hawke 40 mm with 1 inch tube to mount on Benj. Marauder with dovetail mount. What others should know: Steady mounts. 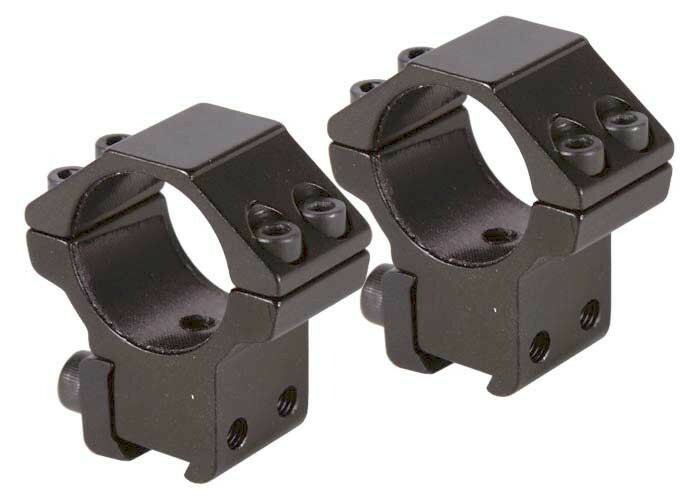 Things I liked: Bought these for my new Umarex Gauntlet to mount a Alpen Kodiak 4-12x40 A-O Wide Angle scope. These were reasonably priced and high enough to allow easy access to the Gauntlet loading slot. They have a locking screw to keep the scope from moving backward or forward. First shot was inch low and inch right. Happy with that. Things I liked: Good mounts, very robust and sturdy. What others should know: A bit of Loctite and never any problems being loose. Things I liked: doing there job well. What others should know: these will work fine on a pcp, but I would not trust them on a hard shooting springer. Things I liked: These work great on my .22 and .25 Marauders and for other PCP and CO2 guns. Even for Springers up to R-7 (HW30 & HW50). I actually prefer one piece mounts for high powered spring and gas ram guns. What others should know: Nice machining and finish. Can't beat the value for the price.